ISOVER has designed an advanced thermal calculation tool to help industrial planners, specifiers and insulation contractors. Calculating thermal performances for complex installations is a very demanding and time-consuming task. 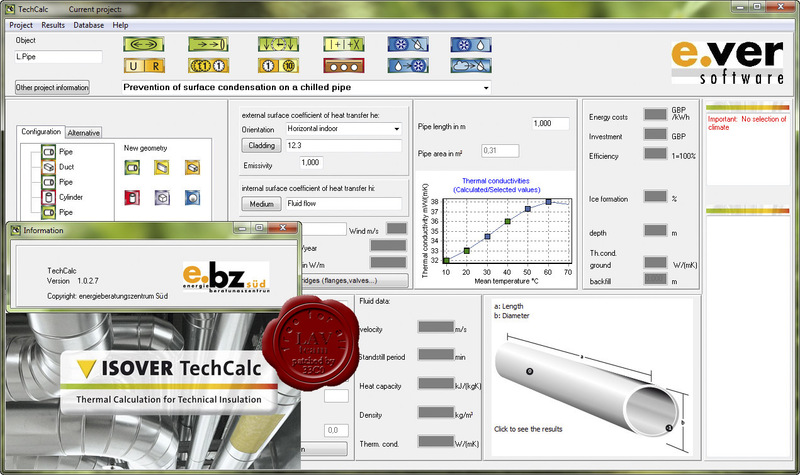 ISOVER has therefore developed ISOVER TechCalc, a thermal calculation tool to help industrial planners, specifiers and insulation contractors to design thermally efficient constructions quickly, easily and with reliable results. Thermal heat flow and surface temperature. Required insulation thickness depending on thermal heat flow and/or surface temperature. Minimum insulation levels required to prevent condensation.Drop in temperature over time for inactive/stored media. Temperature drop along pipe lines. Effect of moisture accumulation on U-values and R-values in cooling and refrigeration pipework. Prevention of freezing in water pipes. Calculation of operating costs and amortisation of insulation work.